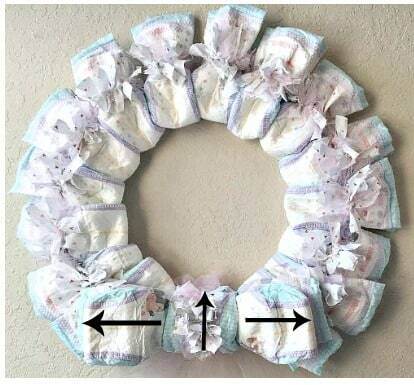 This DIY diaper wreath along with a box of diapers makes for a great gift for a new mom! Before I had Olivia, my very first baby girl, I had a very “been there done that” attitude and thought everything would go smoothly. I didn’t really get too organized or prepare the house because I thought I can just wing it like. Boy was that a mistake! Everything ran smoothly the first week that Franklyn and my mom were around to help out,but the minute I was on my own everything began to come undone. I may know a lot about raising kids, but I’m still sort of new to the whole “work from home full-time with two babies” gig. It was right then and there that I did what I did best. 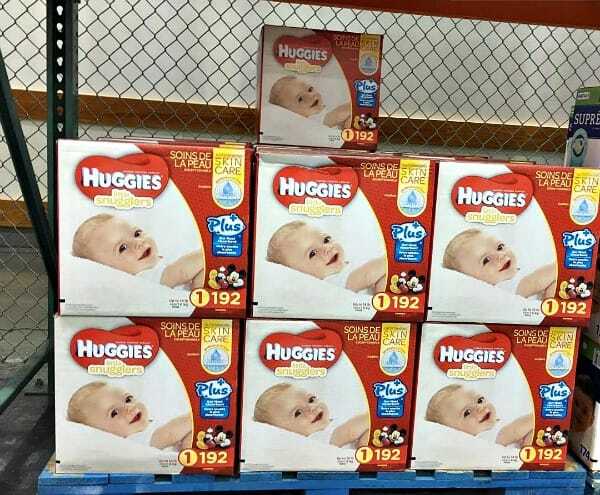 I made a list and went shopping to stock up on Huggies Little Snugglers Plus that are only available at Costco. 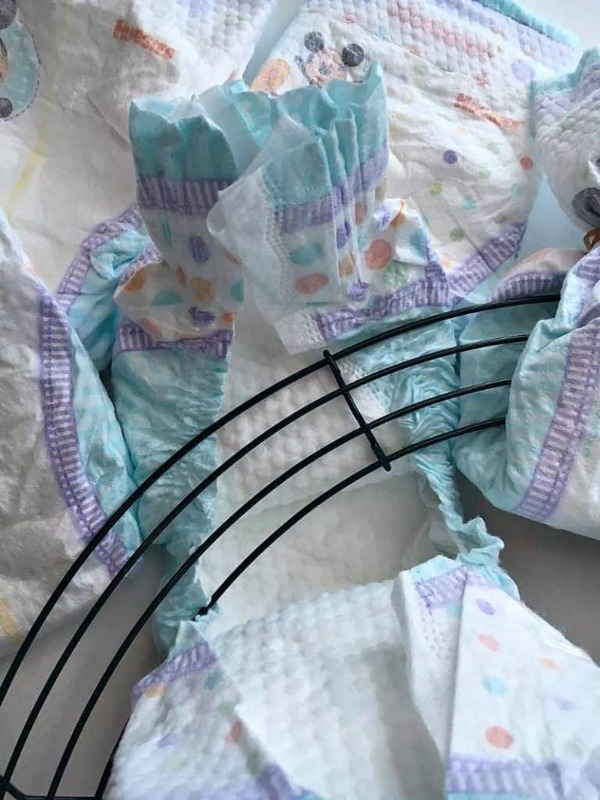 I’ve tried a bunch of different diaper brands but each baby is different. Olivia’s skin is extremely sensitive and Huggies Little Snugglers Plus is designed to help keep baby’s skin clean and healthy. 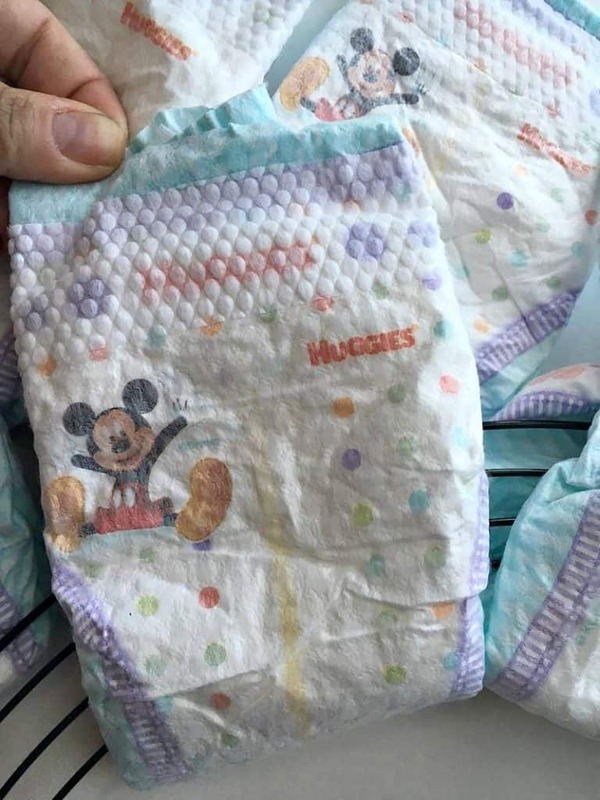 When you combine that with their Leak Lock with up to 12 hours of protection, purchasing Huggies Little Snugglers Plus and Huggies Little Movers Plus (they also have them in sizes 3,4,5 and 6) from Costco is a win-win in quality and value! One of the things I quickly learned as a working mom after having Jospeh and now Olivia is that you have to be prepared! In those first few months a simple way I kept my self prepared at hime was with a baby caddy small enough to put anywhere but big enough to hold diapers, wipes, a changing mat and extra set of clothes. When things got a little hectic while I worked, I simply reached for my caddy instead of running around and getting all the necessities. 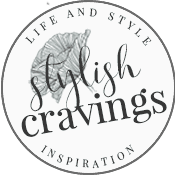 It saved me those precious minutes that every new mom needs! 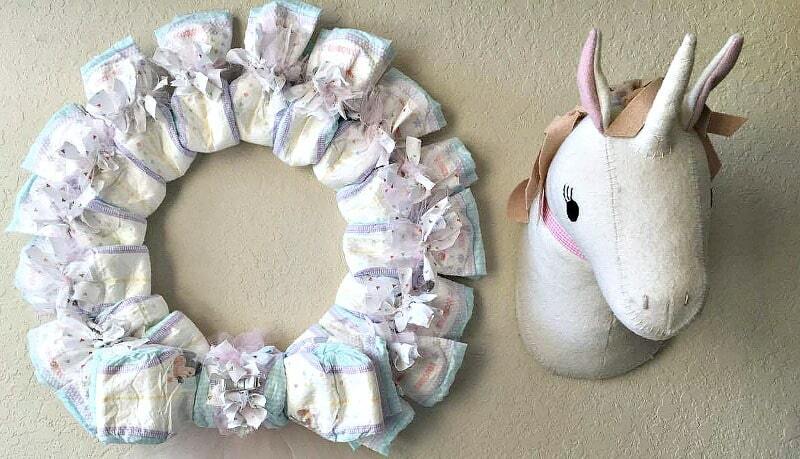 You can also go the cute route and make a DIY diaper wreath with Huggies Little Snugglers Plus. You’ll still have them handy and later on, you can use the wreath in the nursery. 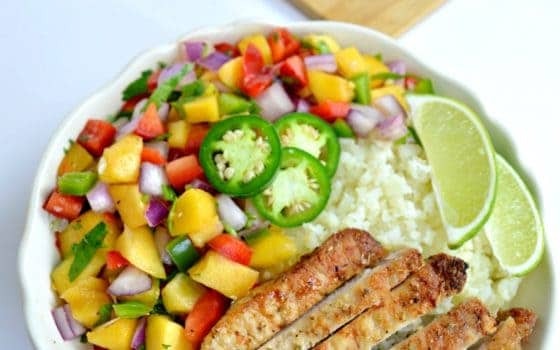 See DIY below! 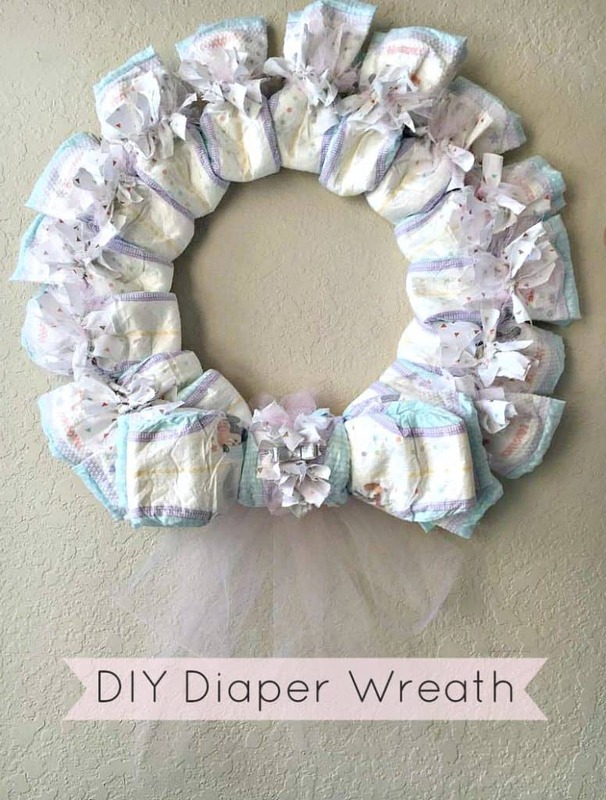 Start by taking a diaper and folding over the bottom inside of the wreaths wire. 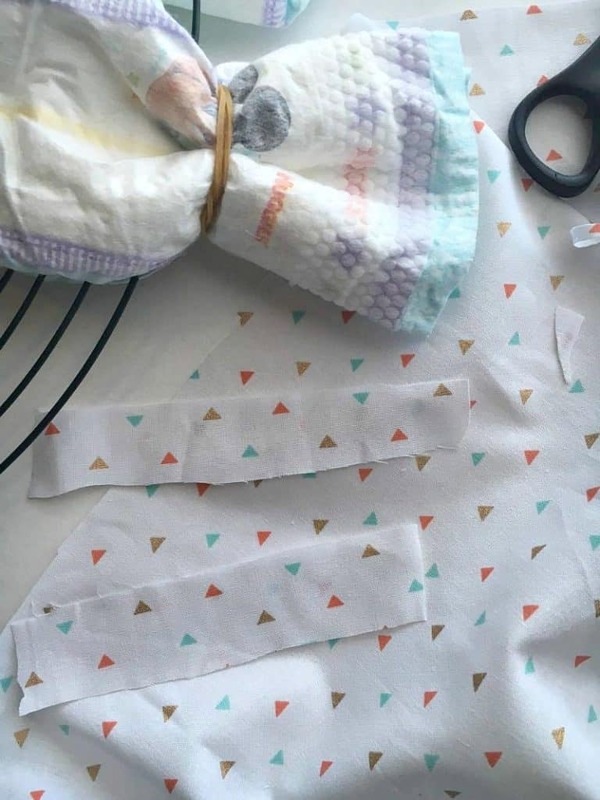 Take a rubber band and secure diaper. Repeat these two steps all the around wreath. Cut fabric and tulle ribbon into 6 inch strips. Tie fabric onto rubber band alternating with tulle ribbon strips. Repeat process on all diapers. 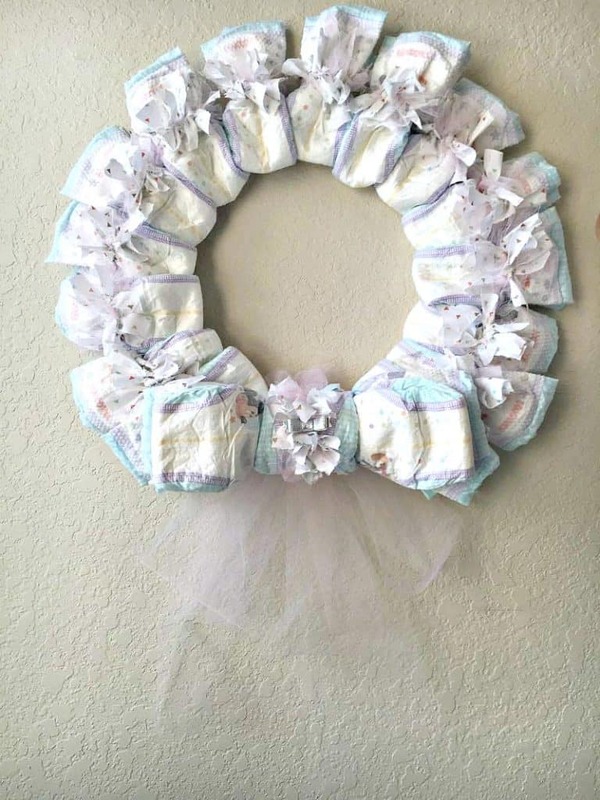 If you look at the bottom of wreath, I created a bow out of three diapers. 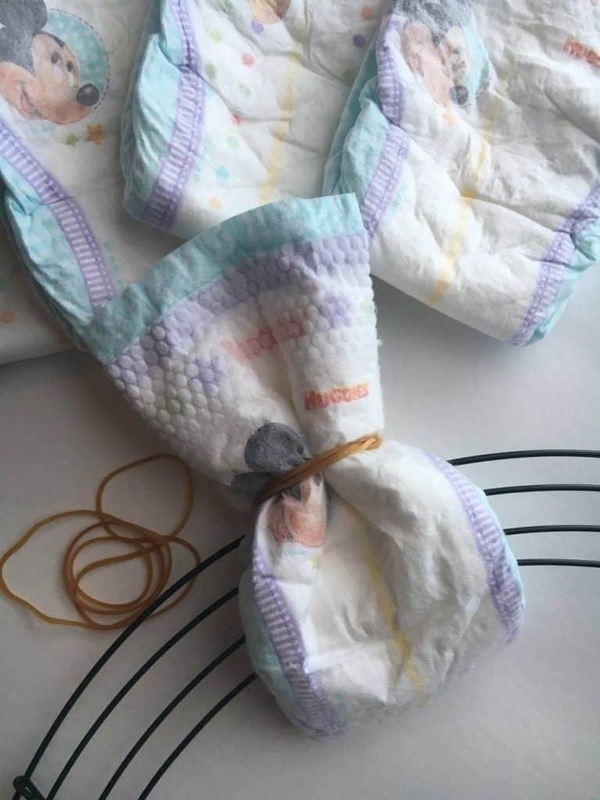 I simply took two diapers and placed them sideways on wire and secured both diapers with rubber band. 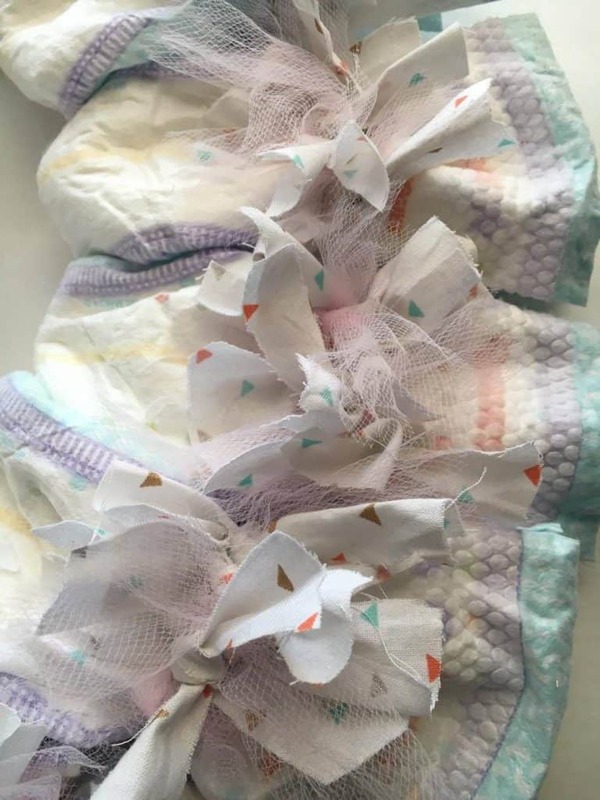 Then I opened up a diaper and wrapped in the center of the two diapers to create a bow and secured with a rubber band as well. See visual below. 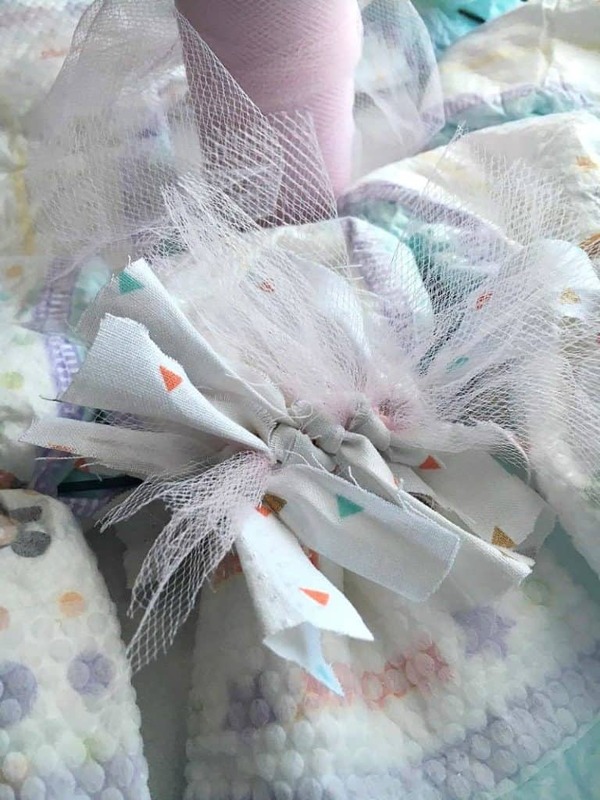 Finish off with some tulle ribbon on the bottom of bow and you’re DIY diaper wreath is done! 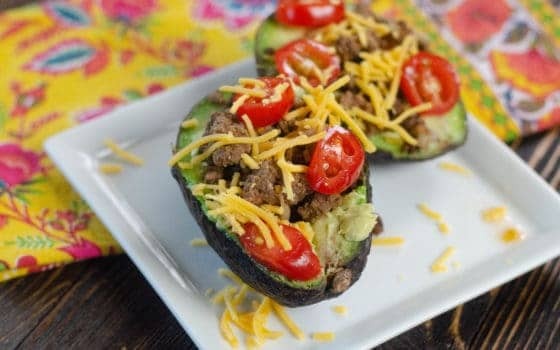 Now’s the time to stock up! 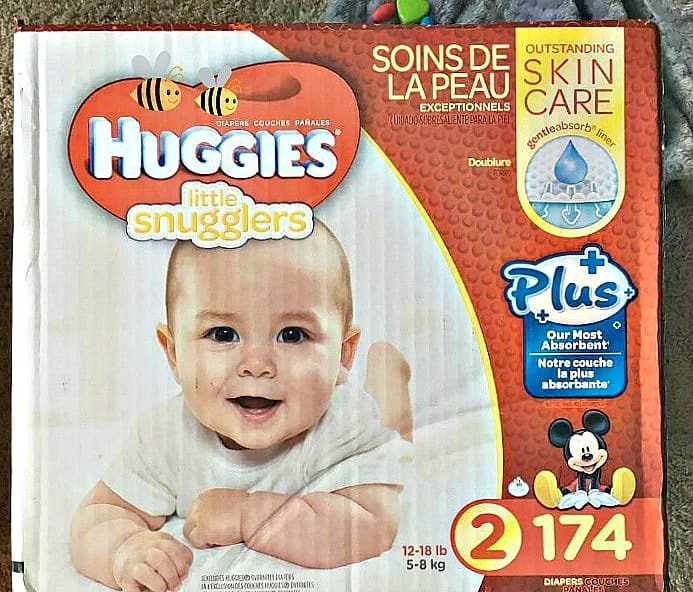 Starting this month at Costco (the only place to get Huggies Little Snugglers Plus and Huggies Little Movers Plus), Little Snugglers Plus will be available in size newborn in select warehouses and online at Costco.com. And from 9/1 to 9/25 Little Snugglers Plus size 1&2 and Huggies Little Movers Plus in sizes 3-6. It will have a $6 discount and free shipping. Wow I get impressed at how the project turned out. I can’t realized what they’re made of. Love your idea. Thanks for sharing!